We planted this Majesty Palm 3 years ago. It is about 12 foot tall with about 1 foot of clear trunk. It's planted pretty close to the house but gets North winds. We always wrap the trunk with Christmas lights and try to cover it with frost cloth when we know below freezing weather or frost is coming. We had 2 days with light frost and a brief drop in temps to 27 that caught us off guard so the palm was not covered. Some of the fronds got burned badly but this thing grows so quickly you can hardly tell it suffered any damage. The picture below was taken August of 2008. How big was it when you planted it? I have one in groung for 2 years and is just now beginning to grow rapidly. It was about 4 foot tall and had a trunk about the size of a beer can. The place we have it planted is right at an area that drains our whole yard when it rains. So it gets quite a bit of water and we also water it daily. 2 nights 29F (not back to back) slight frost. No protection, but in one of the warmer spots near the house. Slight damage to leaves. I think these palms are very sensitive to frost. What I do with mine, when I can beat the frost, is tie all the fronds up with a couple of long bungee cords. Then I wrap it from top to bottom with Christmas lights. Afterwards I wrap the fronds with two layers of frost cloth and tie it at the bottom. I also have a 90w flood light going at the bottom of the palm on cold nights. This works well. The only problem I have had is getting caught with a heavy frost on nights that it doesn't get below 32 degrees. The coldest mine has seen is 26. This year I also sprayed the fronds with Anti-Stress 2000. We'll see how it works. So far it has made it through two light frosts this year on nights where the temps were about 36 with zero damage. No protection other than the spray and the 90w flood. I feel i have been pushing my luck so I will probably wrap it up this weekend for the winter. Thanks for the info. Do you leave it wrapped up all winter once the cold sets in (we are getting to that point here)? I have some foam pipe insulation that I was going to wrap around the base of mine today. I have mine right next to the Koi pond...hopefully frost will be avoided. I haven't, but I have also gotten caught off guard with a frost I didn't expect. This year because of the size and difficulty of wrapping now, I think I am going to leave it wrapped until about March 1st. I wll probably wrap it in two weeks. I have the foam pipe insulation too. It works great. I also bough a roll of foan insulation at Lowes. It works great on wrapping palms with more trunk. You can wrap it over the Christmas lights and it really hold in the warmth. 27F and many hours and nights at or below freezing with many mornings with a short period of light frost. Some light canopy. Slight damage. We hit 29F here two nights ago and my 4 majesty palms have zero damage. I did not wrap them this time although I usually do if it is forecasted to be in the 20's (which is rare). Two are out in the open and two are under a light canopy. We've hit 30F a couple of times this winter along with a few more 31-32F nights. They seem to take a light freeze with no damage at all. The fronds, however, will incur damage with a frost. I do have some brown spots on the fronds due to frost, but it's not too bad. Overall, they seem to be pretty hardy. I have read that they are hardy to 26-28F and from what I have seen, established ones may be even more hardy than that. We hit 26F a couple of years ago and I didn't see a single fried Majesty Palm in the area. I wrapped my crowns and upper trunks for that event and all I noticed was some browning of the tips. Oveerall, I am very pleased with these palms as they give my yard a truly tropical look yet I live in zone 9. Later on, I will add some more pictures with a post-winter update. During the severe cold snap in Florida (January 21 thru 23, 2009) this majesty palm saw around mid 20s on the morning of 1/22/09. This palm will recover nicely as it also looked like this from the radiational freeze of 1/5/01, when it was actually a degree or so colder. Thanks, Jasons & Walt, for your observations and photos. I have read that the rivularis has surprising cold-tolerance for a such a tropical-appearing palm, but seeing how it survives snow always surprises me. Walt - I am so sorry to see the damage your riv took. I remember seeing a photo of it in warmer days, what a striking palm it is. Back in '01 ('03?) - the only serious freeze I recall here since '89 - our rivularis was out in the open - unprotected at a temperature of 27F of at least 2 hours duration. While my heavily-protected spindle had almost 50% damage, the rivularis experienced only some browning of the leaflets. Mind, this palm had already been moved twice, and was in some poor "soil" at the time of the freeze, so it wasn't in optimum condition to receive this kind of chill. Jasons - your photo reminded me of another photo - posted years ago by "Mike in Houston" (I think) of a rivularis in snow. Very moving photos, both yours and his. Wish I could find Mike's, but it was on the previous IPS board. No, no. That isn't my majesty palm, but a distant neighbor's. My largest majesty palm was hurt, but not quite to the extent as the one in the photo I posted. My other majesty palms were also hurt, but much less so. In fact, it took an entire week before the damage finally started to show. Some cold damage just takes so long to manifest itself. And yes, it was January 5, 2001 when we had a bad radiational freeze. That was my coldest freeze ever in the 12 winters I've lived here. Last Thursday was the second coldest for me. Walt, my two majesties are totally defoliated like the one in the pix above. I don't even know if they'll live (but I'm not that attached anyway, and they were free). I wasn't here, but I think it dropped to around 25-27 and stayed below freezing a looooooong time (maybe 14 hours...maybe more). I think we had a real heavy frost too. Now we're holding our breath again to see if we're going to have yet another night that cold (odds seem to favor it). Too many freeze tests this winter! Keith, I have six majesty palms (four with trunks) in the ground. All of mine were hurt but not near like the one in my photo. However, the worst one is for all intents and purposes defoliated, except it isn't a straw color yet as the one in photo. My others are planted in more protected areas and while damaged, they are still respectable. These probably saw high 20s, but no frost. In fact, I had very little frost here. The dew points were very low that morning. 2-1/2 years ago I gave a Archontophoenix cunninghamiana to a friend of mine who lives on the St. Johns River in East Palatka. For the past two winters the palm wasn't hurt at all. I will have to call him and see how it fared from last week. My wife and I purchased from good 'ole Home Depot five of what what we believe are Majesty Palms (ravenea rivularis) at the end of last summer. Being that we are in New Jersey (plant hardiness index of 6a-6b) the trees came indoors soon after fall began, in an effort to avoid them being caught in a frost (which outright killed a few Majesties we had purchased the year before). As they were around 6-7 ft. each we placed them in various spots around the house, not only to prevent any one room from looking like a jungle, but to experiment as to where they would do best indoors; there seems to be much discussion as to the proper way to care for these babies indoors. The results were interesting, but best reserved for a different forum. Suffice to say they all survived the winter well. Sometime around early April, when the weather turned noticeably nicer and the threat of frost was minimal, outdoors they went, onto our deck. While the threat of a frost was minimal, it was not eliminated. The trees went through 4-5 intermittent nights in the next 10 days or so, where the temps were below freezing, somewhere between 32-29F. we were pruning the individual fronds of the trees), or leave them up although the leaves are dead? Your anticipated speedy responses to this are GREATLY appreciated! My guess your palms are still living, based on the fact that there is some green foliage near the base. However, these were potted palms as opposed to planted palms, so the root system would have been sujected to colder temperatures than a planted palm would. Root systems of potted palms are prone to freezing, even though the palm itself doesn't freeze. 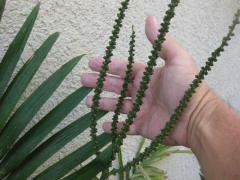 In any event, can you see any emerging spears (developing fronds)? If so, then the palm should still be living. I would, however, pour some fungicide (like copper sulfate or maybe hydrogen peroxide) into the grow bud area where the spears emerge. Lasty, if by chance your palms do survive, be forwarned they may never grow normally again. In my experience, majesty palms, as well as many other zone 10 species, that have been severely cold damaged (but survive) never grow normally again. That is, their growth rate falls to maybe 1/4 of normal. They go on living for many years, but then finally die. Mainly, this happened with untrunked palms. But time will tell, and with majesty palms this should be relatively fast, as they generally put out 10 or so new fronds a year. 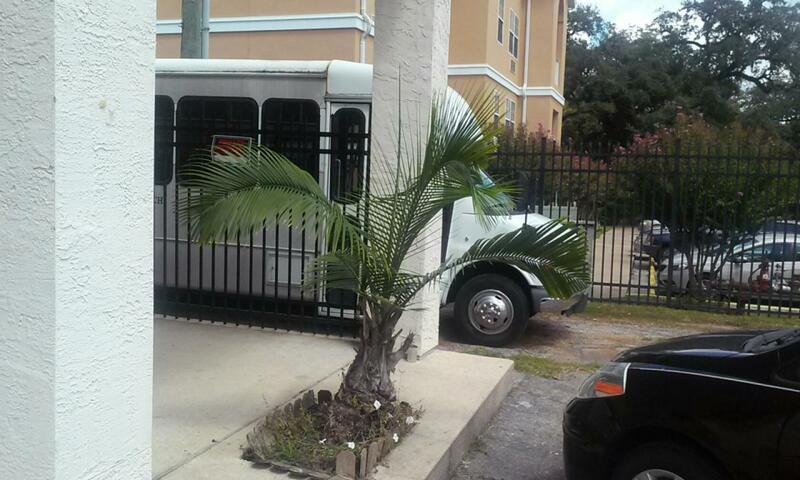 Here are two photos of Ravenea Rivularis (Majesty Palms) that have been surviving in Tallahassee, Florida for years. (Click to enlarge photos) They look terrible every winter, but they come back looking great every summer/spring. Bear in mind that, during winter, Tallahassee is almost the coldest place in all of Florida. These palms may even have seen single digits (Fahrenheit), although they are growing close to a building which might exude some heat in winter. Tallahassee is a fair distance from the Gulf of Mexico. Georgia is a stone's throw away. If you live along the northern Gulf of Mexico coast, then your winters are likely warmer than Tallahassee's -- just to give you an idea of what these Majesty Palms go through every winter. All three of these palms are about six feet tall at the top of the tallest leaf. I don't think they can get any bigger because their trunks are surrounded by concrete. They may remain permanently stunted at this size due to their environmental barriers. It is pretty amazing they're able to survive in Tallahassee. It sounds like they're tougher than queens... I know they defoliate relatively easily, but apparently they're pretty darn tough to kill if they're alive there. From my experience, no way are majesty palms as frost and cold hardy as queens. In fact, in 2010 I lost my largest majesty palm to the cold. It only had a few feet of trunk, but the palm had been well established and grow long before it ever had a trunk. Conversely, I didn't lose any queen palms, not even hurt. The majesty palms in the photo appear to be benefiting from the concrete and structures around it. I don't know what time of day the photo was taken, but the shadows are cast back towards the building, and indicates to me the palms probably get good sun out of the south, therefore may be on the south side (the warmest side) of the building. Possibly, they have some overhead protection. 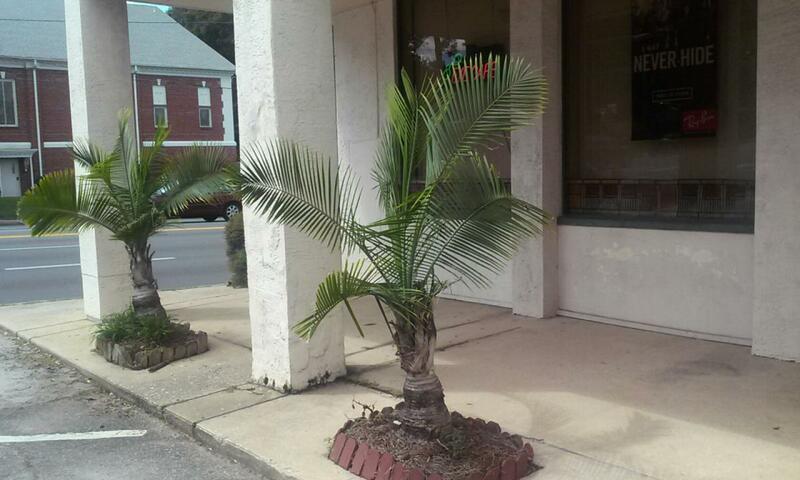 But be that as it may, for majesty palms to survive (at least without protection) in Tallahassee is quite remarkable. The below majesty palms growing in Sun 'N' Lakes subdivision in Lake Placid, Florida, near the east shore of Lake Grassy are the tallest ones I've found in Highlands County. This photo was taken three years ago, so they are certainly a little taller now. In the Tallahassee photo, the three Majesty Palms are planted along the eastern side of the building (facing east). They are right in front of "Eye I Deals" on Tennessee Street, close to FSU. Maybe they receive extra heat from that building in winter, but is there any chance that they are just freaks of nature? Yes, indeed, Tallahassee is one of the coldest places in northern Florida on those chilly winter mornings. Lake Placid, Florida, is considerably warmer, and it much better suited to growing Majesty Palms. Even the Georgia southeastern coast seems to stay warmer in winter than Tallahassee does. By the way, nice Majesty Palms in Lake Placid! Sorry to hear you lost yours Walt, that is kind of surprising. Thanks for sharing the picture, I just saw 3 kind of like that yesterday about a mile north of me. You lost your Majesty when it dropped to 20F there, right? That wouldn't have surprised me until I saw them in Tallahassee. I had always heard Majesties could come back from low 20s, but seeing them in Tallahassee makes me second guess that. Southeastern Georgia should be a lot warmer than Tallahassee. St. Simmons is right at the 9b threshold with an avg low of 25.1 going back to 2000. There are a fair number of queens there too... Tallahasse is 8b if I'm not mistaken. Being next to a building helps a lot, but that doesn't seem like it can fully explain it. I'm not sure what to think of it to be honest. I first saw those majesty palms about 12 years or more ago. About 7-8 years ago I spoke with the owner of those very tall majesty palms. She told me they were brought in (already trunked) from a family owned nursery out of Pahokee, Florida (on the S.E. shore of Lake Okeechobee). They are growing along a canal that leads to Lake Grassy, just maybe 150 feet away, and it's on the S.E. shore of the lake (the warmest side). The majesty I lost died a long, slow death, probably from bacterial bud rot. It was the most exposed of all my majesty palms. 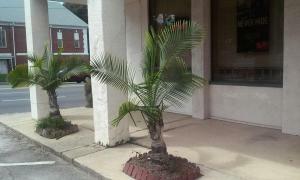 My other majesty palms survived with minor defoliation, but they are planted in more protected spots. I've had majesty palms hurt from temperatures below 27 degrees. They survived but they never grew normally again. That is, they grew very, very slow after that, maybe 1/4 the frond production. They grew like this for 2-3 years then finally died. I've observed this with other species of cold tender palms, too. Don't know why that is, but they never seem to recover from the cold trauma. Well, I believe those Tallahassee majesty palms defoliate every year (or most years) but they always come back with full frond production. Google Maps shows them back in perhaps 2007? or so, and they were smaller then, but still there. RedRabbit, no, I have never seen any Majesty Palms around Gainesville. Correction: There are a few HD Majesty Palms planted here and there, but they don't seem to be more than a couple of years old. Their fronds are too delicate to look good year round here in Gainesville. A Majesty Palm's fronds would probably look fine year round in Orlando or Tampa, but they are simply not commonly planted there. I don't know why because a healthy Ravenea Rivularis looks great. Walt, I am surprised to hear that your Majesty Palm died, although 2010 certainly was exceptional, as the worst freeze event since the 1980s (or so I am told). I have a few small majesty palms myself. If we have a mild winter, they suffer no damage, but if I get temperatures as low as 26 or 27 Fahrenheit, they show considerable leaf damage, so I just cut off the fronds and let them grow back in the spring. They have not seen lower than 26 Fahrenheit because that is my lowest temperature in the last five years ago. I didn't have any majesty palms at all back when the 2010 freeze hit. By the way, USDA has me zoned as 8b because I am located west of I-75. USDA zones anything east of I-75 as zone 9a, at least in the rest of Gainesville, east to Putnam County, etc. Thousands sold at big box stores and planted inground in my zone 9b city.. I've only seen a single trunking palm growing outdoors.. Our median lowest temp of the year is around 25f-27f. Not sure why we don't have more growing. Our soil and water are pretty high on the PH scale... that may be why. I have one sun acclimated , growing in a 5 gal pot.... I'll set it out next spring and test it for cold. My bet is they get planted and treated like a cactus, i.e. not watered. Which is death for a Majesty. Thought I would give you all an update. I moved from the old house three years ago. I lost three out of four majesty palms several years ago when it unexpectedly hit 19 degrees, but the biggest one came back nice and healthy even with a little trunk damage. That last one didn’t survive last year’s freeze when we got down to 17-18 degrees. 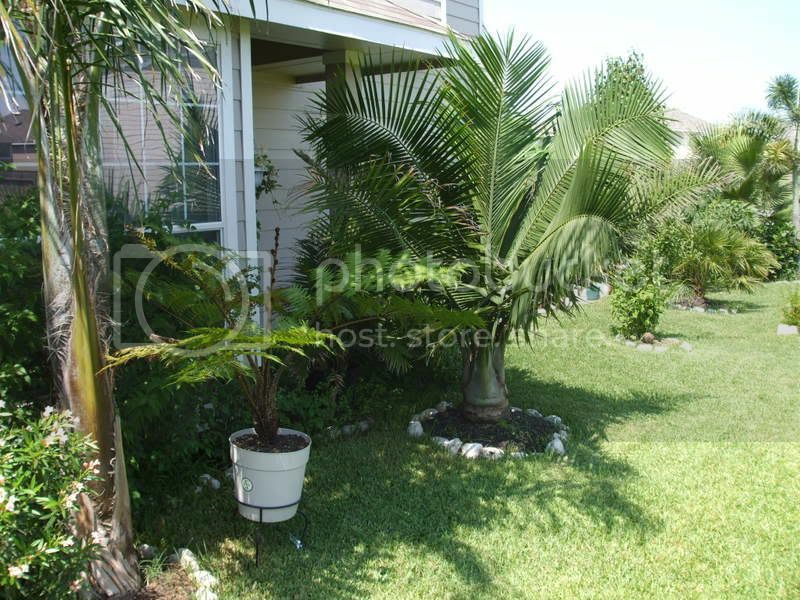 I’m moving to the Tampa area soon and Majesty Palms are on my short list. I plan to plan some of those along with some Kentia palms, and take my chances on a Royal Palm or two. Since December of 2010, when I experienced my all-time low temperature of 20 degrees, none of my majesty palms have been hurt since. Here's a photo of a local majesty palm I took three years ago. This one is growing on lakefront property (lake Huntley, just southeast of town (Lake Placid). Have two in ground here (planted Sept. 2017) on the FL panhandle that are doing great considering the winter we had and both have put out 6-7 fronds since January. They came through the first cold front in early January with the low of 27F with just slight spotting on the fronds. The second freeze with an ultimate low of 24F one morning defoliated them both. The spears were fine and didn’t pull. I’m trying them out as a little experiment and see how long they’ll last here.